Alexa is Amazon’s voice service and the brain behind millions of devices including Amazon Echo. Alexa provides capabilities, or skills, that enable customers to create a more personalized experience. There are now thousands of skills available in the UK from brands like The Guardian, Just Eat, Jamie Oliver and Hive, as well as innovative designers and developers. With the Alexa Skills Kit (ASK), designers, developers, and brands can build engaging skills and reach millions of customers. ASK is a collection of self-service APIs, tools, documentation, and code samples that make it fast and easy for you to add skills to Alexa. With ASK, you can leverage Amazon’s knowledge and pioneering work in the field of voice design. You can build and host most skills for free using Amazon Web Services (AWS). You can also apply to receive AWS promotional credits. Natural user interfaces, such as those based on speech, represent the next major disruption in computing. With Alexa, you can take advantage of this new form of interaction. Engage with your customers through voice on devices with Alexa including Amazon Echo, Echo Dot, Amazon Tap, Fire TV devices, and all devices powered by the Alexa Voice Service. Delight your audience with a completely new way to interact with your service. Customers don't need to use their hands; all they have to do is ask Alexa. The Alexa Skills Kit is a low-friction way to learn to build for voice. Create your first Alexa skill and add a valuable new skill to your developer toolkit. You can get a prototype up and running in just a few hours. You can use your existing cloud-based service to get started. Or you can leverage AWS Lambda, which makes it easy to build a cloud-based service that responds quickly to a voice request. ASK is free to use and AWS Lambda is free for the first one million calls per month. And Alexa skill developers can apply to receive AWS promotional credits to be put toward their Alexa skills. ASK supports command-oriented skills as well as sophisticated multi-command dialogues and parameter passing. You can build the following types of skills with ASK. Log in to our developer portal to start building your skill. A successful Alexa skill starts with well-designed voice user interface (VUI). Engaging voice experiences are based on natural language and the fundamentals of human conversation. Check out the Amazon Alexa Voice Design Guide and watch Voice Design 101 to learn how to design for the ear, not for the eye. If you are building a custom skill, create a framework to map user requests to intents your service can handle. And build out sample phrases so that your skill responds to user intents. Looking for skill ideas? Consider designing a game skill. Twenty percent of our top skills are games like Jeopardy! and Animal Game. Alexa is based in the cloud so she’s always getting smarter and customers never have to download updates to your skill. You can set up your skills in AWS Lambda or another cloud-based hosting service. AWS Lambda is free for the first one million calls per month. You can also apply to receive AWS promotional credits. Check out our documentation on creating Lambda functions. Follow our step-by-step guide to build a custom skill. When coding your skills, refer to our documentation on handling requests and on leveraging ASK samples. You can also build skills faster and with less complexity using the Alexa SDK for Node.js on GitHub. You can start building quickly with our tutorials and code samples. For additional help, check out our webinars and developer forums. Does your company build skills on behalf of customers? Agencies are creating innovative Alexa skills so that brands can reach their customers via Amazon Alexa. If you think your company has the expertise to assist clients in creating skills, please contact us. 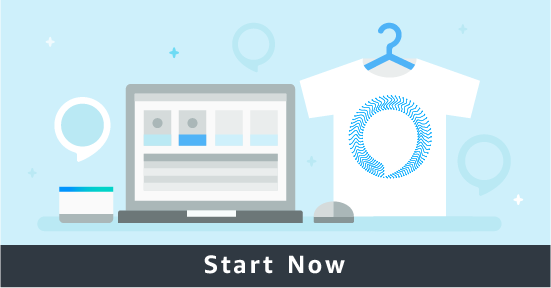 Once you’ve built your skill, get your skill added to the Alexa Skills Store for anyone to discover and use. After your skill is published, you can apply to receive special rewards. There are three steps to getting your skill certified and published. 1. Register your skill to add it to the developer portal. 2. Test your skill using Echosim.io (no device needed). 3. Submit your skill following our certification tips and checklist. Over time, monitor how people interact with your skill, then build on your learnings. Successful Alexa skills evolve over time to enhance the user experience. As you add capabilities to your skill, aim to increase utility. Check out our training page for additional resources. Alexa can now keep you up-to-date with the latest news, opinions, reviews, sports and podcasts from the Guardian’s award-winning journalists. Find out about the latest performances from one of the world's greatest theatres - the Royal Opera House in London's Covent Garden. When Alexa launched in the UK, Ocado saw the opportunity to reach their customers in new ways. After months of rigorous user testing, they have built a skill that creates a seamless shopping experience via voice.